canyoning and canyoneering are essentially the same thing, just with regional variation in what it's called. I propose that these tags be merged and a synonym created to avoid confusion. I've generally heard it referred to as "canyoneering", but that seems to be mostly only used in the US, with "canyoning" being more common elsewhere and having more questions tagged as such on the site. Therefore I suggest we merged "canyoneering" into "canyoning" and edit the tag wiki of "canyoning" to mention that it's also known as "canyoneering". rappelling and abseiling mean the same thing, and the tag wiki for rappelling even says "also called abseiling". rappelling has more questions than abseiling (14 vs 5) and seems to be more commonly used in my experience, so I would suggest merging "abseiling" into "rappelling" and also creating a synonym. Note: There has been much consternation about this post, and it seems to stem from my originally saying "merge request" and not "merge + synonym request". 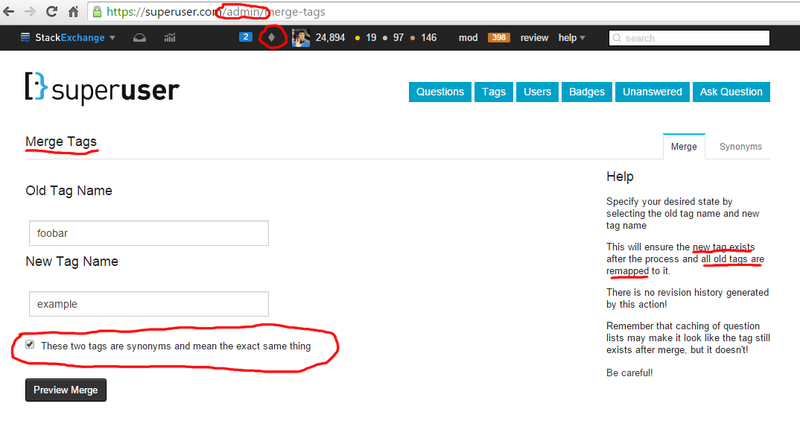 On other SE sites, posts tagged tag-merge-request are implied to be requesting a synonym be created at the same time. Apparently TGO users aren't familiar with that assumption, so I'm hereby clarifying that. I don't propose to remove wholesale all references to abseiling or canyoneering, I simply am proposing that we clean things up so it's easier for everyone to find it. If you disagree because you're afraid of the word "merge", please read the rest of this post very carefully before voting against this. Edit: To everybody saying "no don't merge them, just make a synonym, merging is bad! ", you don't understand how it works. When you create a synonym, all future posts using the synonym tag are automatically and immediately retagged to the master tag. You can see an example of this with gear and equipment. Post a question with the gear tag and it will immediately be retagged to equipment as soon as you hit submit. This is how synonyms work. When the user is creating or editing a question, they can type in any of the synonyms and be presented with the relevant master tag, making it easy for somebody to type (for example) abseiling and see the rappelling tag complete with a little "also: abseiling" text below it. All merging does is it retags any questions which had the synonymous tag before the synonym was created. This is just to ensure consistency and make it easier for people to search. If you support making a synonym, there is literally no reason at all why you should not support merging the tags. As you can see, there is a checkbox for "these two tags are synonyms, and mean the exact same thing". When you check that box and click "merge", any instance of the old tag is converted to the new tag, and a synonym is created mapping the old tag to the new one. If you merge tag1 into tag2 and check the synonym box, then all questions with tag1 will be retagged to tag2, and any time somebody types tag1 into the search box or the tag list on a question it will suggest tag2 automatically. It does and it doesn't. Merging makes the old tag unavailable. Yes, it means when you search you only see one tag, but it still will find the main tag. On Ask Ubuntu, 12.04lts is a synonym of 12.04. When you search for it, it shows 12.04 tagged questions. In fact, it redirects the URL to be a 12.04 search. If you merge abseiling into rappelling and create a synonym, people can still find the right tag! You can't do both, one or the other. Merging completely destroys the original tag, and all posts have tag A. Suppose a post is tagged b, and you merge b into a, all posts with b will end up with a and there will be no way to search for b. No. Merging is a different action. It can be used in different situations, for example a really rarely used tag can be merged into another. But synonyms are for when they are used a lot - in the 12.04 case. I am quite sure you a) cannot do both and b) it would be redundant. Merging is a separate tool, has a separate use case and this is not it. When you say "you don't understand how it works" I'm sorry, but I really don't think you do - this is not the place to do it. If you want users to add abseiling and it turn into rappelling, then you need a synonym. Merging would remove this functionality, and also mean you don't see the "also 12.04lts, ubuntu-12.04", pictured here. And therefore is not searchable. Which we don't want - if I came here, I'd tag my question abseiling, and want to search for abseiling. I personally feel that they should not be merged. As Liam already explained the main purpose of tags. These are the keywords that can help us get more visitors and hence potential users. There are plenty of examples of such tags at the Great Outdoors. For example, flashlight and torch. What we (in India) call a battery-powered portable hand-held lamp: a 'Torch', in US they call it a 'Flashlight'. Both are same equipment, serving same purpose. Indian users will find Flashlight a relatively unknown term for that. That said, I think the tags which are pure synonyms are okay to be merged. e.g. equipment and gear (Not in context of Bicycles obviously), and tools for that matter. A second example would be of tags washing and cleaning. Make them synonyms - use the most popular as the main one (I agree this may be hard to decide on, but ask the community on meta). Then, when someone types in the other one, the system will say, underneath the main one also: [other tag] - this tells the user that they are related. A tag synonym is usually a tag that has exactly the same meaning as some other tag, such as algorithm and algorithms. In some cases, tags that are subsets of other tags will also be considered synonyms, such as java-se for java. The system organizes tags in a master–synonym relationship. All uses of the synonym tag for any given master tag are automatically converted to the master tag. So, users can enter a synonym tag when writing a question, but the master tag will be displayed when the question is loaded. Editing a question tagged with a synonym tag causes it to be replaced by the master tag. Similarly, when users search for questions tagged with a synonym, a list of questions tagged with the master will be displayed. Users with more than 2500 reputation (1250 on beta sites) and a total answer score of 5 or more on a given tag may suggest synonyms for that tag. Users with a total answer score (total upvotes minus downvotes) of 5 or more for a given tag may vote for synonyms for that tag. Suggestions will be automatically approved when they reach a score of four, and automatically deleted when they reach a score of negative two. If there aren’t enough people aware of the proposed tag synonym, or if you aren’t sure whether the synonym is a good idea, open a discussion on your site’s meta, tagged discussion tags tag-synonyms (for questions about the synonyms on this site, Meta Stack Exchange, add meta). It's a good idea to mention the synonym in the tag wiki, as suggested. Not the answer you're looking for? Browse other questions tagged support status-completed tag-synonyms tag-merge-request .